George Zimmerman is a murderer. 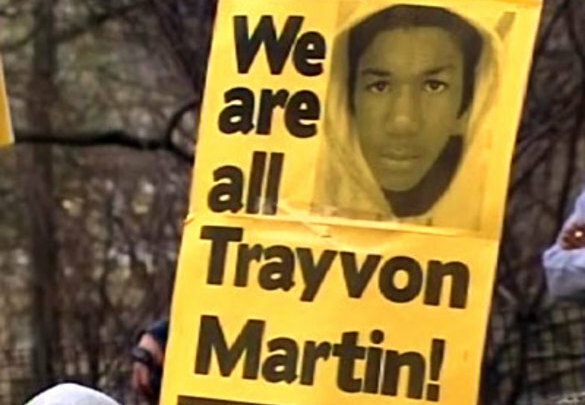 On February 26, 2012 Zimmerman stalked and shot his victim, 17-year-old High School student Trayvon Martin, unarmed and on his way home from a convenience store. On July 13, 2013 he succeeded in escaping justice for that murder. He did not escape justice because of a Florida gun law. He did not escape justice because Trayvon Martin defended himself from Zimmerman using physical force. George Zimmerman is free while Trayvon is dead for the simple reason that his victim was a young black man, and he, and the jury, were not. This injustice, reinforced by the so-called “justice system” of a society built on racism, genocide and rabid exploitation, is not a new one. The Jim Crow of old has evolved into a new norm of the harshest sentences for black and Latino offenders, much more lenient sentences for whites, and amnesty for white policemen and vigilantes who murder unarmed blacks. While it was Zimmerman the individual who profiled Trayvon, and it was that profiling that led to the shooting, it was a white supremacist system that validated this profiling—that accepted that a grown man with a gun following a child against police commands was somehow not at fault. Zimmerman was only arrested and put on trial because of the mass mobilization calling for his arrest in 2012. Had it not been for this, the racist U.S. system would doubtlessly have let him go unpunished without resorting to a trial, which itself was a farce designed to divert and subdue the people’s energies and attempt to placate the popular righteous anger, and to return things in the United States to the status quo. The trial became not an assessment of whether Zimmerman was guilty of murder or not, but whether Trayvon deserved to be shot, deserved death for not immediately becoming meek and submissive when a strange man confronted him in the dark. Martin’s failed attempt to defend himself became the basis for Zimmerman’s acquittal, asserting that young blacks don’t have a right to defend themselves. This theme to our criminal justice system, this ubiquitous double standard in “self-defense” pleas can be understood by contrasting Zimmerman’s acquittal with the case of Marissa Alexander, a black woman who received a 20-year sentence for firing warning shots in a situation of domestic violence. Apparently, a black woman who didn’t kill a man larger than her firing warning shots is not legitimate under this system, but Zimmerman murdering a child he followed in the night is. This murder, and the travesty that this trial has brought forth, add to the enormous body of evidence that people of color and working people cannot find justice in the American system. Rather, America’s justice system remains a vehicle where those with power and privilege are able to defend that power and privilege from the working class, to defend the U.S. system which lets racist killers go free. This injustice cannot stand. The American Party of Labor extends its condolences to the family of Trayvon Martin, stands in solidarity with the mass movement against racism and inequality, and furthermore unequivocally states that justice for Trayvon Martin and the countless others murdered by the U.S. government and those it protects on a daily basis can only become a reality through the mass mobilization and organization of our people on a revolutionary basis. ‹ Who Will March for Marissa Alexander?